A worker was seriously injured when removing a 65 pound vertical drop pipe using an elevating work platform. As the pipe was being lowered, it became jammed. The worker was using the platform to free the pipe when the pipe slipped and struck him in the face. He lost an eye and required reconstruction of his left cheekbone. A worker was killed when the elevating work platform he was using to paint a ceiling tipped on its side. While moving the elevating work platform to change painting areas, one of the tires drove into a pipe hole. This caused the elevating work platform to tip and the worker fell, suffering a fatal head injury. Many accidents associated with elevating work platforms occur because fundamental safety rules are ignored. Ensure operators are properly trained and have demonstrated hands-on proper use of all controls. All elevating work platforms must be inspected, tested and maintained according to the manufacturer’s recommendations and safety bulletins. Use an elevating work platform appropriate for the job. Do not override safety devices and do not use when safety devices are defective. Check ground and floor areas for any hazards such as holes, slopes and obstructions. Do not drive near drop-offs, holes or loading docks. Mark or barricade any hazards. Stabilizers such as outriggers, extendable axles, or other stability enhancing means must be used as required by the manufacturer. The elevating work platform must not be positioned against another object to steady the platform. 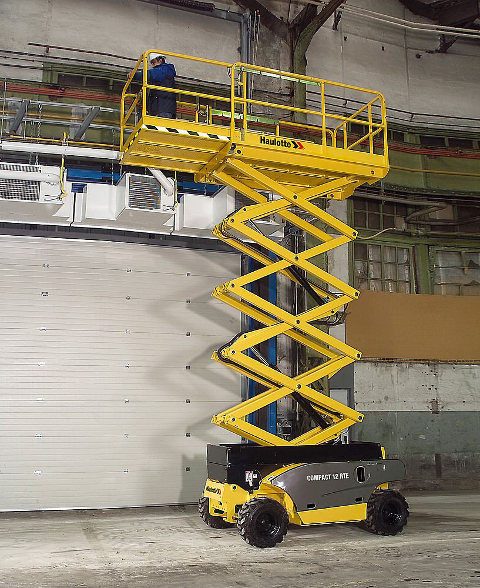 Ensure your elevating work platform(s) is equipped with fully functioning tilt sensors. Do not raise platform on slopes or soft surfaces, and not drive onto a slope when elevated. The elevating work platform must not be used as a crane unless approved by the manufacturer. The operator must maintain the minimum safe approach distance (MSAD) from energized conductors at all times, in accordance with subsection 289(1) of Regulation 91-191. Tools and materials must be properly secured and evenly distributed on the platform. Never climb on guardrails and do not use ladders, planks, steps or any other devices on the platform to gain greater height. Implement correct fall protection system for operators as required in subsection 130(2) of Regulation 91-191.